This summer, I read a great book about anchor charts. I make tons of anchor charts with my students each year, but there are times when I feel frustrated if my students don't use a chart the way I planned for it to be used. So, when one of our professional development presenters recommended a book about anchor charts, I popped open my laptop and put it in my amazon shopping cart right away. 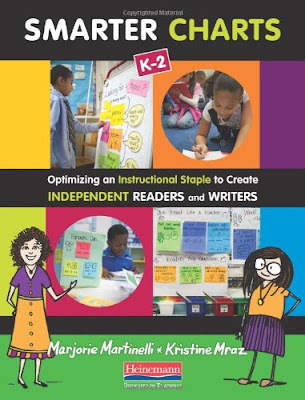 The book is called Smarter Charts by Marjorie Martinelli and Kristine Mraz. I took this book to the beach with me for 4 days in a row while we were on our camping trip. One of my favorite things about the book is that it is full of photographs of different charts. I learned lots of new things, developed some new ideas and finished it feeling good about some of the components that I already use well when making anchor charts in my classroom. Here are some of the highlights from my notes from the book. You can click on the image to download a copy of my "notes" for yourself. During my back to school shopping, I purchased two things to help me improve my anchor charts this year. I purchased them at Staples when they were buy one get one free (but they were originally $12). Using large post it notes will allow me to add things to charts without "messing up the whole chart". Have you ever called a kid up to add something to a chart that took you forever to prepare and they write something like "socr" (soccer) on your carefully crafted amphibians chart? 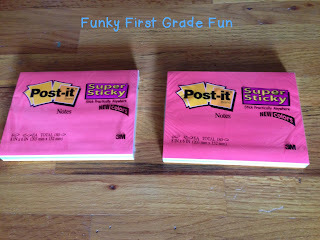 Large brightly colored sticky notes to the rescue, "socr" gets peeled off and you say the nice teacher thing before you help the little guy/girl think of something more appropriate. 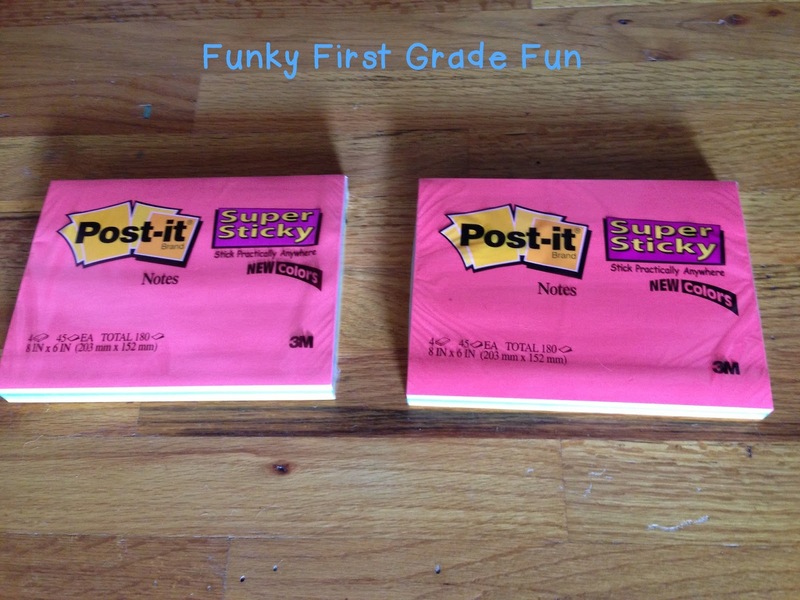 I will also use these brightly colored post its to add special vocabulary words or things that I want them to refer to later. Using double sided tape will allow me to tape student work samples and or pictures of things related to what we are learning about to the chart. The authors of the book stress the importance of creating charts in front of and with students. 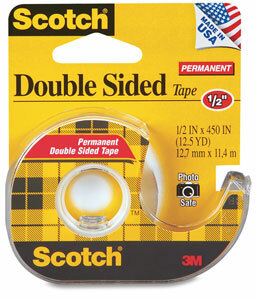 It is much faster to use a piece of double sided tape while building an anchor chart than it is to glue all the pieces. I have several reusable anchor charts in my classroom. 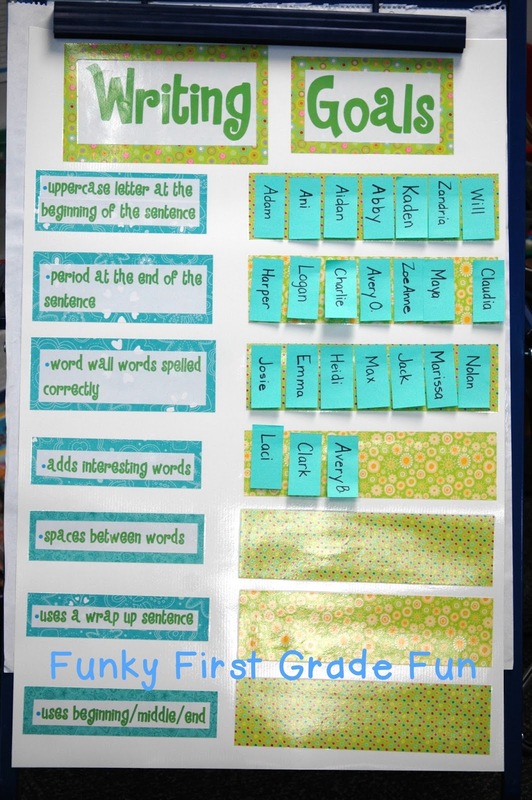 I prepare parts of the anchor charts in advance, laminate them and then let my students use sticky notes as we build a chart together during a lesson. You'll notice that I tend to use lots of scrapbook paper. Here are a few of my reusable anchor charts. 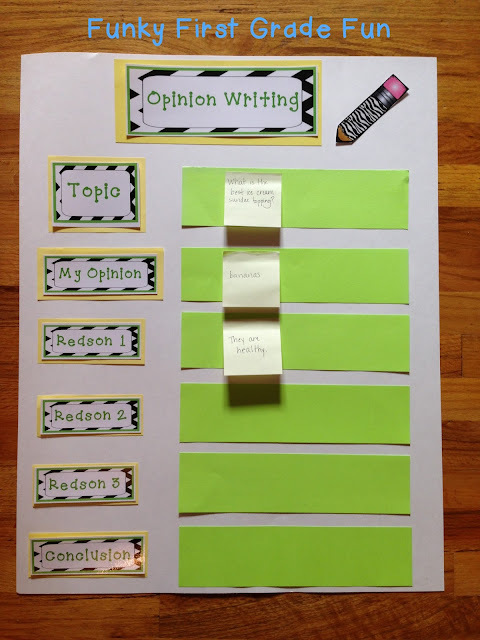 This chart is from my Writing My Opinion pack. I took this picture before I laminated it...but it's laminated now. The pieces to make the chart are included in the pack. This is my reusable story mapping anchor chart. 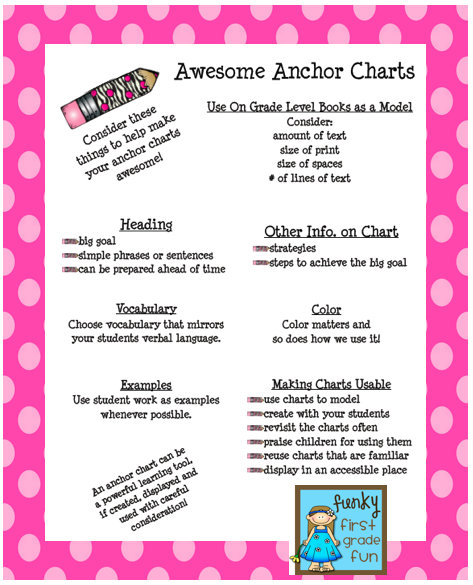 Long ago, I wrote a post about how I use this anchor chart. You can read it and grab a story mapping freebie here. 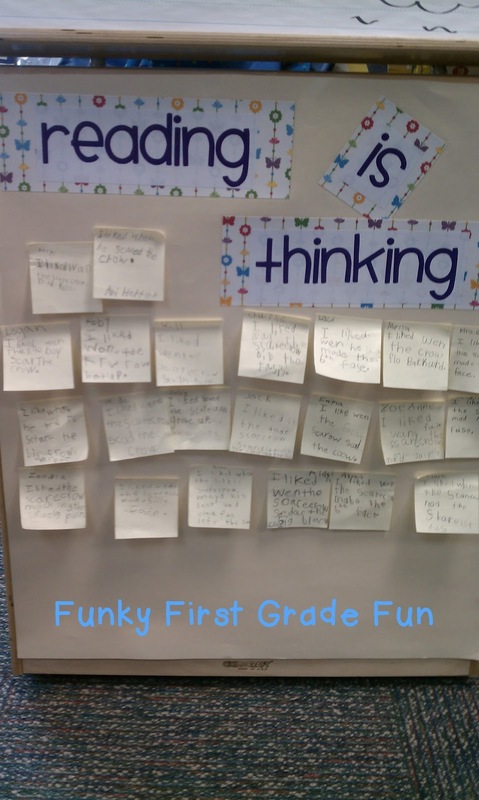 This is my reusable Reading is Thinking chart. I use it for all kinds of different things. If we are working on characters, I might have the children respond to something about a specific character on a post it note and add it to the chart. If we are working on text to self connections, I have them write about a connection they had with a certain book. My students share their post it note as they add it to the chart. You can read an old post about how I use this chart and grab a main idea freebie here. This is my reusable Writing Goals anchor chart. I wrote a post about how I use it in my classroom here. Obviously, not all of my anchor charts are reusable. With the help of my sandy copy of Smarter Charts, I'm hoping to kick up the awesome factor while making and using anchor charts with my students this year. Now, I'm gonna kick off my slippers and get some sleep. Thanks for sharing the pics of the charts! I'm trying to utilize anchor charts more this year. Sounds like I need to check out that book! YES! I am a big fan of Post-Its on anchor charts. Probably because we use the Units of Study by Lucy Calkins and Lucy is alllll about anchor charts and post-its (oh, the Post-its I use... lol, not just for anchor charts!). Great post! You have a new follower! I'm inspired! I just visited Amazon to get that book and I'm looking forward to making some anchor charts. I haven't seen those Post it notes here (Canada) but I will be on the look out for them. Thank you!! I love that the anchor charts involve students and can be reused throughout the year and in future years! 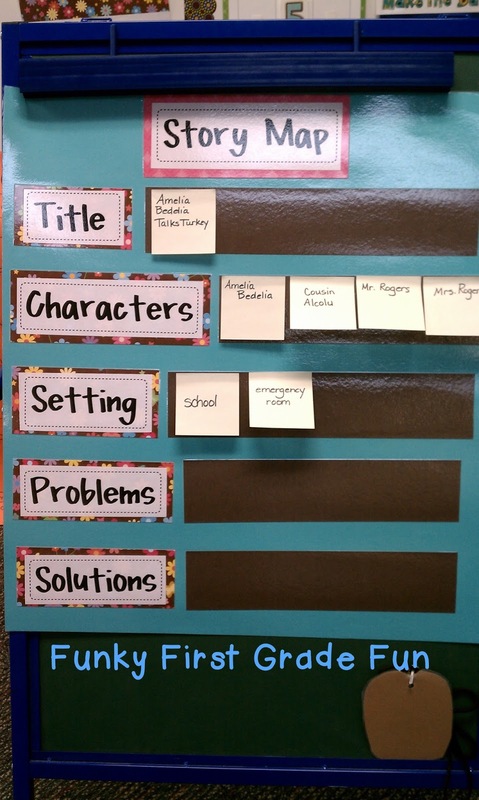 What are your tips for storing your anchor charts and for having them up in the classroom? I've seen the binder ring and curtain rod/PVC pipe idea. I just don't have much wall space. Thanks for any suggestions! I know you write for a first grade classroom, but I think I can incorporate your anchor charts in my high school ESOL Language arts class. Reading comprehension is a bear in a second (third, or fourth) language so any way we can pull it apart increases comprehension. Thanks for your post!